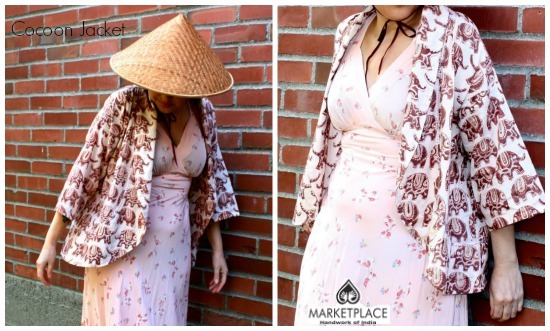 Once again, I'm honored to join the ranks of fashion bloggers asked by Marketplace: Handworks of India to style one of their beautifully made garments. 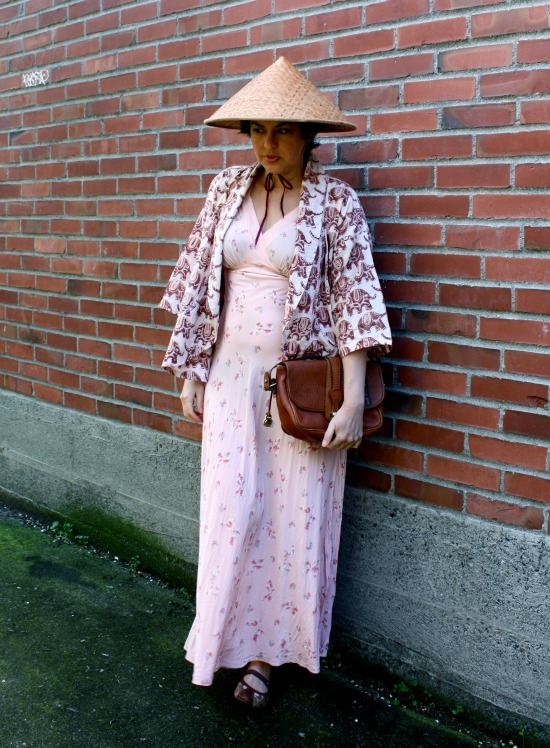 My previous posts discussing this ethical fashion brand, can be seen here, and here. For those who might not have heard of this brand- Marketplace India is a fair trade, not-for-profit organization that "combines the experience of running a business with a variety of support programs designed to effect real, meaningful, and lasting change in the lives of low-income women in India." The Rose + Elephant: Sustainable, internationally flavored personal style. They work with 480 artisans, who are organized into a number of independent co-operatives to create quality women's apparel and home decor. The garments are incredibly well made, and the quality of construction showcase the true beauty of "slow fashion." The designs eschew the turbulence of trends, but instead are created with an eye for detail and years of enjoyment. The aesthetic can be ascribed to a world cultural/ neo-boho vibe. I'm wearing a great lightweight summery jacket from their spring/summer collection. 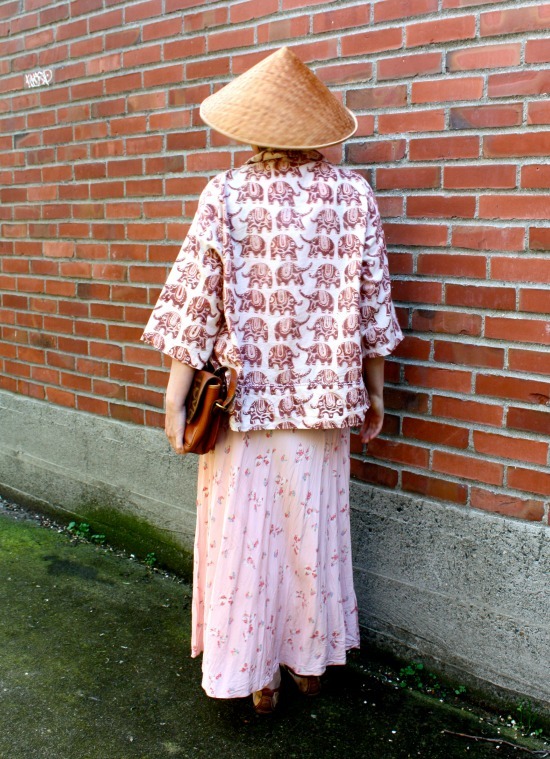 Christened a Cocoon Jacket, it's a woven cotton shrug, expertly sewn from a natural colored cotton, with an elephant block motif printed all over, made from natural vegetable dyes. #SECONDHANDFIRST: 90% thrifted. 100% ethical. 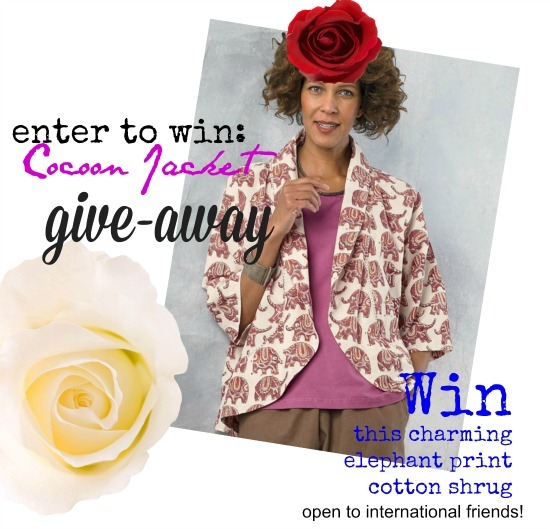 I'm going to be giving away the lovely Cocoon jacket sent me by Marketplace India, and YOU could win it! Just be sure to LIKE us on Facebook, and for extra entries, you can LIKE Marketplace on Facebook too. Also, we'd love you to leave a comment sharing your favorite ethical fashion brands, so share the love, and share to win! Contest ends April 27th, and the winner will be announced next Monday, April 28th. This give-away will be open to all, including our international friends- so good luck, and remember to shop #SECONDHANDFIRST. unfortunately i don't buy so many fairtrade clothing items here in India because it is very expensive but I do know of one company called Soma that does handblock prints on kurtas etc. and I go to support the people who sell handmade items at a craft fair because it supports the person and not the corporation . smaller businesses really do matter and it helps .. I also buy organic food whenever possible . I think fairtrade is very important and hope that moore people start buying soon ! Booth clothes and food . Really love that slip dress - so gorgeous ! And you dear rosebud are so beatiful ! Fantastic styling, Bella! Very intriguing. Love the jacket and how you styled it!!! I love stuff from SERRV....I think Marketplace is part of them. They are based locally and I pass their store on my way to my moms! I love the elephant print, and the way you've styled this jacket! I love Marketplace India and I love elephants. Double win. I love everything about this outfit. You need another jacket so you can wear this outfit again and again. I don't think any of us could style this as great as you do. I love the jacket...also elephants have almost universal spiritual meaning. Thanks for the introduction to marketplace India. My favorite ethical brand is thrifted "handmade lovingly by someone in the past". I recently found my daughter a simple cotton back button top with eyelets made by someone in the 60's. We will never know the original owner, but I believe my 22 year old duaghter channels its fresh and spare vibe. So pretty on you, Bella, and a worthy ideal. Excellent, as always. I love companies like this. The elephant print is super sweet. That is one fabulous outfit on you Bella, looking gorgeous in the subtle pink shades! Not online much nowadays as I'm heavily pregnant with twins, but still love to stop by when I can to catch another hit of inspiration from you. Your creativity is astounding! Love the hat and pale pink suits you. Dreamy!!! So great to see sustainably made clothes that combine ethics AND great style. The cut of the dress is beautiful and the print and drape of the jacket works perfectly with it. Good timing for 'Fashion revolution' day on 24th April (asking among other questions, 'who made your clothes?'). Have just name-checked you and 'shop secondhand first' in my post about sustainable fashion.